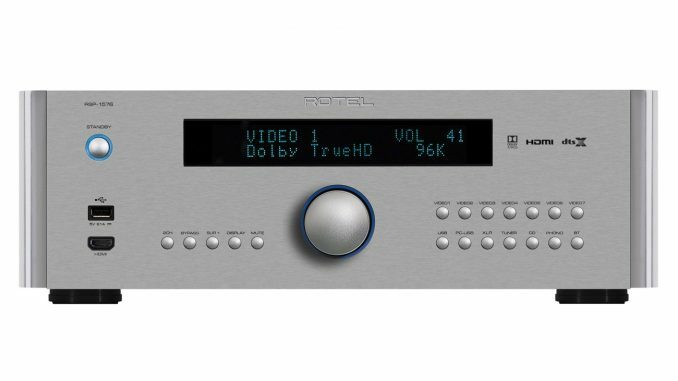 Rotel’s latest surround sound processor is bang up to date with all the latest surround sound formats, codecs and technologies. But the RSP-1576 also pays particular attention to audio and video signal routing and integrity to ensure superior performance. Thus, it features a beefy toroidal transformer, separate analogue and digital voltage regulators, and slit-foil capacitors, while the audio circuitry has been specifically tuned for sonic quality. On the digital conversion and signal processing front, the RSP-1576 makes use of six Wolfson 192 kHz/24-bit audiophile-grade D/A converters and a pair of Texas Instruments DSP chips, allowing full compatibility with all current surround and 3D sound formats – from simple 5.1 to Dolby Atmos 7.1.4 and DTS:X. The RSP-1576 doesn’t offer any built-in room correction, which will please purists who prefer setting their own parameters – the Rotel does come with a 10-channel parametric equaliser. Many RSP-1576 buyers will opt to have the processor professionally installed, however. As one would expect of a flagship processor, the array of facilities is extensive. Included are seven HDMI 2.0a inputs and dual HDMI outputs, all supporting 4K pass-through and HDR 10. Audio input interfaces includes XLR and RCA, as well as both optical and coaxial digital inputs, as well as a USB Type B input. Adding to the Rotel’s versatility is a moving magnet-compatible phono input, while aptX-driven Bluetooth is also supported. The recommended retail price is R54 550. Experience Ascendo Immersive Audio for yourself!